In their search for high growth, companies today no longer can count on demographic changes or emerging markets. Is robust business growth on the horizon? The S&P Global 1200 would have you think so. According to that index, companies will have to grow collectively by 4.7 percent in 2013 and again in 2014 to justify their end-of-2012 share prices. That’s a tall order, considering that GDP growth in much of the developed world was low or even negative for 2012. To fulfill the market’s expectations, business leaders must find new sources of growth that are both significant and attainable—because for many companies, the search for fast growth has hit a wall, rosy interpretations of the S&P notwithstanding. Won’t emerging markets save the day? Don’t hold your breath. India’s growth rate in 2012 was its lowest in a decade, and Brazil’s has declined significantly over the past three years. There remain a few hotspots (see chart), but not enough to provide all of the growth that companies need. What about significant new growth driven by demographic shifts, such as aging populations? Also unlikely; many companies are still wrestling with how to turn these shifts to their advantage. Where, then, will companies find the next major opportunity for above-market levels of growth? 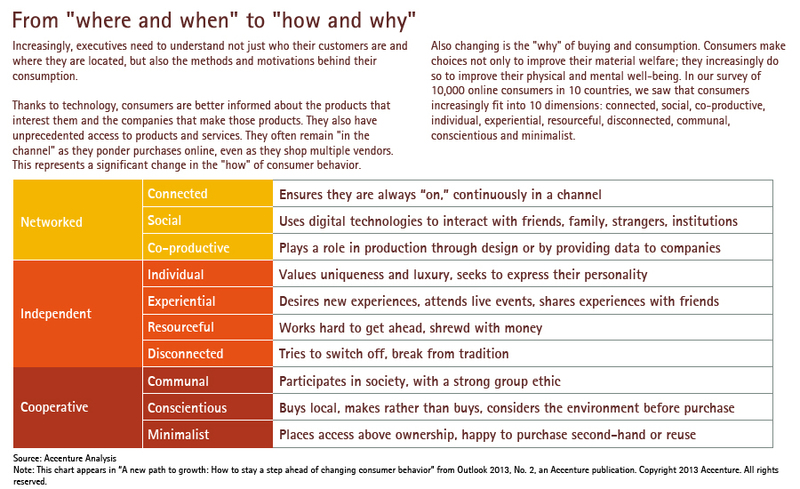 Accenture research points to an area so old it is once again new: changing consumer behavior. How is consumer behavior changing? Consider just a few examples: the professor in Stockholm who checks her email before bed and, when she finds an invitation to a conference in London, immediately goes online to buy airline tickets from a travel site; the young tech worker who gets his first job in Silicon Valley, sells his beat-up old car and then signs up for a car-sharing service for those times when he needs personal wheels; or the mother in São Paulo who chooses a particular brand of paper products for her family because they were produced with sustainable methods. These examples, and others like them, all point to increasingly prevalent changes in consumer behavior that Accenture identified in a 2012 survey of 10,000 online consumers in 10 countries. Such changes are of more than academic interest. We hypothesized and then demonstrated that targeting changes in consumer behavior—such as the increasing focus on environmentally safe products or a greater emphasis on seeking unique experiences—lay behind many of the world’s fastest-growing industries and successful companies. That led us to analyze 20 of the industries and sectors associated with targeting behavior changes—including, for example, video on demand, fair trade goods, low-cost airlines and digital music. When we ran the numbers, we saw that market size for just that group of 20 industries is projected to more than double, from $2 trillion in 2012 to $4.5 trillion by 2016, with an expected compound annual growth rate of more than 20 percent. That’s three and a half times faster than the projected growth in emerging economies, and more than 10 times the projected rate for advanced economies, over the same period. Are companies fully prepared to capture that growth—or, indeed, to add on to it? To answer that question, we studied the world’s 3,000 largest public companies, identifying those whose median revenue growth most exceeded their industry peers in the past three, five and 10 years. 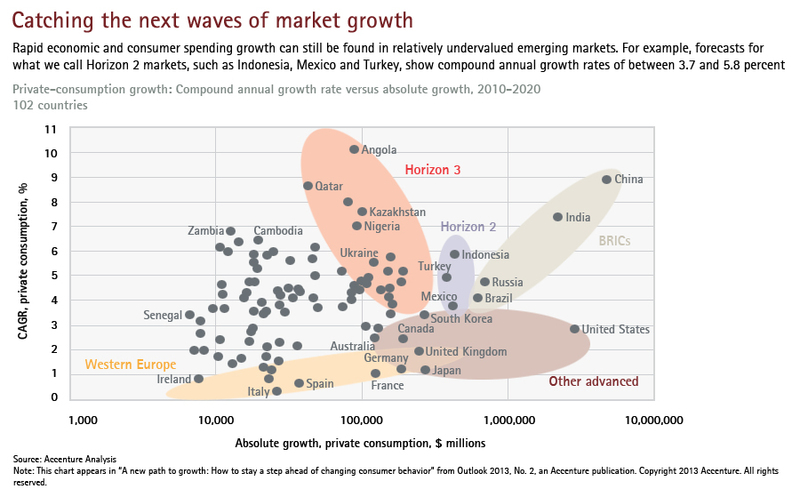 Many of the growth leaders have been serving new customers in emerging markets, in both B2C and B2B markets. But roughly a third of the leaders have achieved their accelerated growth by meeting the needs stemming from changing consumer behavior. By studying this specific set of companies in greater detail, we were able to identify three common elements behind their success. Consumer-led growth leaders use advanced analytics to identify and bridge gaps between their businesses and consumers. Many companies are getting much better at understanding customers by using analytics and, more important, by using data-derived insights to design and improve the customer experience. Such capabilities are critical in realms such as entertainment, where experience is king. Consider gaming company Activision Blizzard, which has drawn on a deep understanding of consumer preferences. The company grew steadily as a developer of video games from its founding in 1979 through 2007. But its 2008 merger with Vivendi—which included Blizzard Entertainment, publisher of such massive gamer hits as World of Warcraft—set it on a path to greater success. In 2012, Activision partnered with a couple of analytics firms to test and improve its gameplay in real time. One firm captures data on 190,000 games and 250 million consumers daily, data that Activision can use to effectively launch mobile games from third-party developers. The second has a leading platform for in-game behavioral analytics and will help Activision “balance and optimize” games in real time, in the words of one executive. Activision has also used what it gleaned from analytics to successfully enter the mobile games market. Although many gamers remain loyal to their trusty consoles, the company recognized that mobile gaming has been gaining market share. To meet this challenge, the company is developing new technologies to tailor mobile games for its customers. For the mobile game Skylanders Cloud Patrol, Activision tracked the way players were using characters; when executives realized people weren’t changing from one character to another very often, they adapted the game to give each character specific powers. Activision also used analytics to experiment with versions tailored to different countries in order to understand how and where to adjust the game. The key to Activision’s success has been its adherence to the quality of the experience. Instead of flooding the market with mediocre titles, the company concentrated on developing a reputation for delivering a few high-quality blockbusters. By spending a great deal of time with focus groups and testing ideas on key audiences to tease out the nuances of consumer behavior, Activision’s business intelligence group is able to study what its audience likes and dislikes. This approach highlights a key element of an analytical toolkit: the ability to hire, retain and train in-house analytics talent. Consumer-led growth leaders see disruption as an opportunity. They instill a mindset attuned to perpetual change that allows many of them to shape their industry’s long-term direction. Creating a corporate mindset that is aware of and open to ongoing business-model and technological change is extremely difficult. The companies we observed that had successfully instilled an early warning, adaptive mindset were especially good at detecting threats at the edge of the radar screen. They were also masters at quickly coming up with innovative responses to disruption. Car-rental company Hertz has a history of identifying and embracing change. A few years ago, a thorough examination of its industry spurred Hertz to attempt to capture an increasingly important type of consumer at the edge of its mainstream business—what we call the minimalist, who, in this particular case, is an urban consumer who spurns car ownership in favor of car sharing. In 2000, when Zipcar entered the market, car sharing was a barely discernible feature on the car-rental landscape. Since then, however, the business model has established itself as a phenomenon with significant potential for high growth. This came into sharp focus for Hertz when the CEO’s son returned from college singing the praises of Zipcar. Hertz rolled out its own car-sharing business in 2008. The outfit—now called Hertz On Demand—began modestly, with a business model similar to Zipcar’s, offering hybrids, electric cars, luxury cars and other options for round-the-clock short-term usage with hourly rental fees that included gas, insurance and roadside assistance. By 2012, Hertz On Demand had grown to 130,000 members and had projected revenues of more than $30 million. Hertz has also signaled its dedication to the minimalist consumer through acquisitions: In 2009, it acquired Paris-based Eileo, a firm with expertise in developing car-sharing technologies, and in 2010, it acquired Flexicar, a leading car-sharing company in Australia. Another key to the adaptive mindset, especially in response to potential disruption, is lateral thinking—that is, seeing opportunities outside your core business. Education giant Pearson saw digital disruption as a sizable opportunity to better serve students and teachers, so the company revamped its offerings to accommodate what we describe as connected consumers, who are always online, connected via a ubiquitous, 24/7, mostly digital channel. Education services such as software and IT support have replaced textbooks as Pearson’s primary breadwinner, while acquisitions including EmbanetCompass, an online-learning services provider to North American colleges and universities, are expanding the company’s presence in that area. Pearson’s ability to think laterally becomes especially clear in the way it creates a unified educational experience between offline services and online educational products. For example, Pearson provides technology infrastructure, software and consulting services to K-12 schools in the United States. Among the technology offerings: information systems that allow schools to track student schedules and systems that help teachers create lessons. Pearson also works with initiatives such as Udacity and MIT’s edX that offer “massive open online courses” (or MOOCs). If students want to receive accreditation for their MOOC, they can go to one of the more than 4,000 physical testing centers Pearson operates worldwide. The company has also developed mobile apps to connect teachers, students and parents on a common platform for sharing student information. Pearson’s publishing arms have also been among the first movers shifting to digital. Penguin India was the first Indian publisher to launch an e-book program, while the Financial Times Group’s FTChinese MBA Gym App (a tool with tailored training courses and special articles from the Financial Times) has become one of the bestselling education apps on iTunes in China. Consumer-led growth leaders react flexibly to changing consumer behavior, scaling offerings rapidly after identifying a successful response. In the successful companies we observed, two hallmarks identify the agile organization. They respond to change rapidly, through acquisitions and investments. And they learn quickly from the changing environment, immediately sharing what they discover with stakeholders. Online auctioneer eBay’s early recognition of what we call resourceful consumers—thrifty types who use online platforms to buy used products or to sell directly to other consumers—backed by an aggressive, rapid-response acquisition strategy, is a perfect example of the first hallmark. In 2000, newly launched e-commerce business PayPal, with its popular peer-to-peer electronic payment system, averaged about 50 times more payments per day than eBay’s proprietary online payment offering. In 2002, eBay completed the acquisition of PayPal. Following the acquisition, PayPal grew rapidly within the auction site; up until the global economic recession in 2008, eBay’s payment business grew more than 30 percent in revenues each year. By the end of 2011, PayPal accounted for 38 percent of eBay’s total revenues. In 2007, eBay expanded its portfolio of collaborative businesses by acquiring StubHub, the “fan-to-fan” event-ticket reseller. Like PayPal, StubHub’s growth soon began to outpace that of eBay’s auction site. Despite its later agreements with larger sports teams and venues, the composition of StubHub’s growth—65 percent of its tickets in 2011 still came from individual and part-time resellers—indicates the growing power of the collaborative economy. Agile organizations also learn quickly, and pass on what they learn. To meet the needs of increasingly conscientious consumers, companies have to equal—and even exceed—industry standards for environmental responsibility. Several Brazilian paper companies, including Klabin and Suzano Papel e Celulose, stand out for their efforts. In particular, Suzano was the first pulp and paper business (and the first Latin American company of any kind) to quantify its carbon footprint globally. The company now ranks second worldwide in eucalyptus pulp production (eucalyptus, which is highly adaptable and fast-growing, is considered an ideal species for planted forests) and eighth largest worldwide for overall pulp production. The company assisted nearly 3,800 people through its Community Agricultural Project, in which residents received instruction on environmentally friendly methods of seed selection and farming. As a result of these efforts, 97 percent of its suppliers in the Brazilian state of Maranhão were under contract a year before the operation even started. The idea that consumers are changing is not new. What is different, however, is the way in which they are changing and the seemingly random directions consumer behavior can take. This diversity presents companies with a substantial problem, as they try to apply traditional business models—premised on size and scale—to a more complex and fragmented reality. Retailers, for example, must meet the expectations of consumers accustomed to buying goods online at competitive prices and having them delivered quickly. And they must do so while creating offerings that are distinct enough to address individual preferences while still meeting expected standards of social and environmental responsibility. For many, juggling these demands may seem like trying to square the circle, and business leaders might feel daunted by the challenge. The answer lies in responding to change with analytical skill, an adaptive mindset and an agile organization—successfully wedding the scale advantages of the large with the tailored approach of the small, the traditional benefits of the old and the cutting edge of the new. Paul F. Nunes is the managing director of research for the Accenture Institute for High Performance. He is based in Boston. Samuel Yardley is a London-based strategy manager in Accenture Management Consulting. Mark Spelman leads Accenture’s global thought leadership program and the company’s strategic relationship with the World Economic Forum. He is based in London. The authors would like to thank Ivy Lee for her contribution this article.